^^RH: "The problem of suicides appears to be at least in part due to the fact that India's value added agriculture continues be among the lowest in the world." It this statement is true, then, according to the graphs you have shown, Bangladesh must also be facing this problem of 'farmer suicides'. Therefore, their population is increasing by 1,200 people each and every hour. If that farmer had not committed suicide, it would have increased by 1,201 each and every hour. Therefore, our population is increasing by 500 people each and every hour. HWJ: "It this statement is true, then, according to the graphs you have shown, Bangladesh must also be facing this problem of 'farmer suicides'. Can you confirm?" No, Bangladesh is not because it has a lot more rain water to grow its rice than Indian farmers do to grow cotton, the wrong crop in drought stricken non-irrigated areas. In fact the entire country of Bangladesh is one large river delta which makes it prone to periodic flooding. However, Bangladesh rural poverty levels are very high similar to Indian rural poverty levels. HWJ: "Therefore, their population is increasing by 1,200 people each and every hour. If that farmer had not committed suicide, it would have increased by 1,201 each and every hour." It's ludicrous to compare productive farmers suicides with people dying for other causes, including natural deaths. In fact, WHO data shows that India's premature death rates are among the highest in the world while those in Pakistan lie somewhere in the middle in spite of recent violence. Please see this link about pakistan's future by Finance Minister. It's very common. Indian Punjab is the bread basket of the country contributing more then any other region. This is why many Sikh;s want independence, they realise how the Indian union is holding them back. As for other parts of the country where suicides are common I am afraid there is no solution for them for the time being. Drought, urbanization, suicides and other factors are contributing to India’s dwindling population of farmers – once regarded as the very heart and soul of India’s society and economy. According to census data from the Indian government, the number of farmers in the country plunged by 9 million since 2001. "Cultivators," as the Indian government describes farmers, now total some 119 million, making them the second-largest group in the workforce in absolute numbers, but representing just below 25 percent of the total number of workers, down from about one-third in 2001. While the number of “cultivators” has been decreasing, there are actually now more agricultural laborers (that is, people who work on farms but do not own the land) – numbering some 144 million, or 30 percent of the total workforce, up from 26.5 percent in 2001. "The rise in agricultural labor could be explained by the falling size of land-holdings over time," Census Commissioner C. Chandramouli said, according to The Times of India. P. Sainath, an expert on Indian rural affairs, suggests that the decline in Indian farmers is a national tragedy. Writing in The Hindu newspaper, Sainath notes that India is losing more than 2,000 farmers every single day and that since 1991, the overall number of farmers has dropped by 15 million. Part of this reduction in the number of farmers has to do with an epidemic of suicides by rural cultivators trapped in enormous amounts of debt. "We have been undergoing the largest catastrophe of our independent history — the suicides of nearly a quarter of a million farmers since 1995,” Sainath said at a lecture at the Institute of Development Studies in Kolkata. The India Tribune estimated that an Indian farmer kills himself every 12 hours. According to the National Crime Records Bureau (NCRB), between 1995 and 2009, more than a quarter-million farmers committed suicide. In 2009 alone, more than 17,000 farmers committed suicide just in the state of Uttar Pradesh. Some experts believe the actual number of farmer suicides is much higher than official data indicates. “The official statistics in India rely on the National Crime Records Bureau -- basically what are police reports of suicide," said Professor Prabhat Jha of the Center for Global Health Research in Toronto, according to BBC. “Even now, 60 years after the British left, 70 percent of India’s farmland depends on the monsoon,” Das said. Further, Professor Jha points out that the practice of suicide is spreading across the breadth of Indian society, particularly among the young. “While suicide in farmers is certainly an important [phenomenon], if we’re concerned about suicide we need to look at the bigger picture,” he said, according to the Post. Indeed, Jha noted that the rate of suicide among Indian agricultural workers and farmers amounts to about 7 deaths per 100,000 people, while the overall suicide rate in India is more than double that amount. Global investment firm Goldman Sachs probably didn’t think it would be accused of meddling in India’s domestic politics when it upgraded its view on India. But with national elections due within a few months, it made the mistake of attributing some of its positive sentiment to the leading opposition party candidate. The ‘Modi-fying” was a clear play on the name of Narendra Modi, the prime ministerial candidate of the Bharatiya Janata Party, the main opposition party to the ruling Congress Party-led United Progressive Alliance. A smarter thing for Minister Sharma would’ve been to cite the rest of the reasons that Goldman Sachs listed in its report for raising its investment case on India–a variety of measures taken by the current government and India’s central bank in the past few months and that are finally beginning to bear fruit, making India a better investment case. BJP and Mr. Modi, in particular, have been focussed on infrastructure and capital spending in the past and a BJP-led government may be beneficial for the investment demand pick up, in our view. Some of the key data points and lead indicators related to investment demand have started to show signs of pick up. The decline in new project starts in industrial and infrastructure projects seem to have halted in 2QFY14, although project starts still remain at low levels. We are also seeing early signs that fewer new projects have stalled – an indication that we may be close to a trough in the investment cycle given recent policy initiatives from the government and new approvals coming through in power and road projects. Over the last month, earnings sentiment has improved significantly… with early signs of pick up in investment demand. Foreign inflows into Indian equities have remained strong this year despite the excessive volatility and sell-off in emerging markets…. While FII flows have been strong and “sticky”, which has been supportive of the rally in equities, domestic institutions have been net sellers of equities…. If the recent rally and optimism regarding leadership change stem the redemption flow, the equity demand/supply balance could shift more favorably. As elections loom closer and turnouts at Modi’s rallies easily outstripping those at Congress rallies, was Minister Sharma’s outburst a sign of panic? He would’ve better served his party by just holding up the report and taking some credit. Reducing number of Indian farmers does not present a problem as long as agri production is not reducing. It is in fact desirable that people move from being small time cultivators to working in industry. What you refer to as positive I.e. so called value addition in form of greater animal husbandry has a different way of being looked at also. As mentioned by. Vinod Khosla, meat production requires he most amount of land and a disproportionate amount of other resources. 1 kg of red meat requires 7.6 kilos of grains and more than 6800 litres of waters as well as 4.4 mega jokes of energy to produce. If you think that Pakistan's 'leadership in this area in a region that is water stressed, energy starved and has many food insecure people is something to boast about - fine. Clearly there are other viewpoints that differ from yours. having said that, the problem of farmer suicide is a real problem and it arises due to agricultural indebtedness. India policymakers are working on addressing the issue and the there is a significant downward trend. Simply because Pakistan does not measure such things and in fact has not even had a census since 1998 does not mean Pakistan does not have problem with suicides. GP65: "Reducing number of Indian farmers does not present a problem as long as agri production is not reducing." This statement would only make sense if there was significant rise in ag productivity which is not the case in India. GP65: "Vinod Khosla, meat production requires he most amount of land and a disproportionate amount of other resources"
That's the usual vegetarian argument. What it ignores is the fact that livestock economy is a lot more than meat production. It also includes dairy and poultry which are very important sources of protein for humans. GP65: "Simply because Pakistan does not measure such things and in fact has not even had a census since 1998 does not mean Pakistan does not have problem with suicides." All anecdotal evidence and data from independent sources shows Pakistan has very low rates of suicide. When suicides do occur, Pakistani media covers them extensively. Pakistan's overall pre-mature death rate is much lower than India's, according to WHO data. GP65: " Until recently you used to make a big deal about open defecation in India which is widely reported within India and has attention of policymakers, turns out Pakistan also has a serious problem - simply that it is not widely reported and does not have the attention of policymakers"
Such data is widely available and reported ad it shows Pakistan's open defecation problem is not nearly as big as India's. And the reason for it is the success of CLTS (community-led total sanitation) campaign in Pakistan. Jim Rogers is a tax dodging idiot symptomatic of the breed of over confident idiots who wrecked the world economy in 2008. No food self sufficiency.no industrial base civil war raging.literacy of around 10%.. Though dwarfed by China India is a far better place now than in 1947 and should kicking and screaming become a second world country(per capita usd 10K(nominal),full literacy,70% urbanized) in the 2025-30 time frame. The population size will inevitably lead to economic superpowerhood...behind the US and China but far larger than any other country. 'China was a shambles as recently as 1980. Again incorrect China overtook India in ALL major HDI indicators literacy,access to basic health care ,military might in this 1947-80 period obviously they did somethng right?The social capital that led to the growth of the next 30 years and still continuing was done in this period. HUMANDEVELOPMENTINDEX. Pak better than India on poverty. WORRISOME India ranks lower than Pak on gender equality too. Chetan Chauhan. After each visit, her husband, a farmer named Veera Reddy, sank deeper into silence, frozen by some terror he would not explain. Three times he cut his wrists. He tied a noose to a tree, relenting when the family surrounded him, weeping. In the end he waited until Ms. Musukula stepped out, and then he hanged himself from a pipe supporting their roof, leaving a careful list of each debt he owed to each money lender. She learned the full sum then: 400,000 rupees, or $6,430. A current of dread runs through this farmland, where women in jewel-colored saris bend their backs over watery terraces of rice. In Andhra Pradesh, the southern state where Ms. Musukula lives, the suicide rate among farmers is nearly three times the national average; since 1995, the number of suicides by India’s farmers has passed 290,000, according to the national crime records bureau, though the statistics do not specify the reason for the act. Even death is a stopgap solution, when farmers like Mr. Reddy take their own lives, their debts pass from husband to widow, from father to children. Ms. Musukula is now trying to scrape a living from the four acres that defeated her husband. Around her she sees a country transformed by economic growth, full of opportunities to break out of poverty, if only her son or daughter could grasp one. But the trap that closed on her husband is tightening around her. Like nearly every one of her neighbors, she is locked into a bond with village money lenders — an intimate bond, and sometimes a menacing one. No sooner did they cut her husband’s body down than one of them was in her house, threatening to block the cremation unless she paid. Her appeals to officials for help have been met with indifference. Lately, her fear has been getting the better of her. 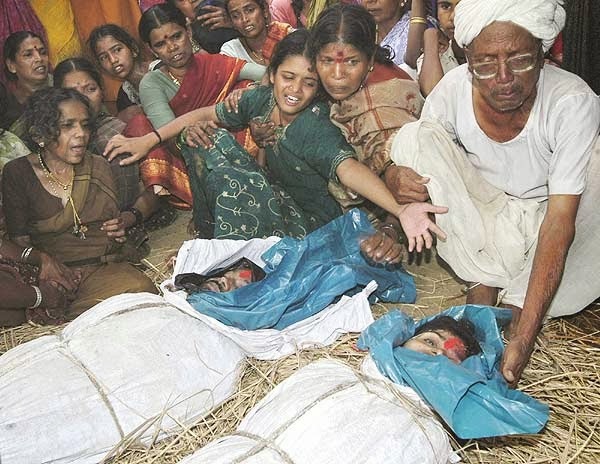 Five farmers took their lives in Maharashtra in the three days to Monday. The wave of farmer suicides in the rain-shadow regions of Marathwada and Vidarbha continues unabated despite the new Bharatiya Janata Party government announcing relief measures to combat the agricultural crisis affecting more than 19,000 villages in the State. Three consecutive years of drought and unseasonable rain have broken the spirit of farmers. Reports say changing weather patterns, mounting indebtedness and poor crop yield are driving farmers to suicide. Tulsidas Madalwad, a minor farmer, electrocuted himself at Kakandi village in Nanded district unable to pay off the debts accumulated over multiple bad harvests on his two-acre farm. “He returned from his field and electrocuted himself by stringing wires to his feet around 10 a.m. When his wife and little daughter came with food, they found him charred to death,” a villager said. Madalwad was devastated by the destruction of his soya bean crop and was worried about repaying more than Rs. 1 lakh to banks and local moneylenders, the people said. In the neighbouring Latur district, Sangram Bemde, 46, another marginal farmer, immolated himself on Monday after his cotton crop failed for the third consecutive year, traumatising his family and relatives. Kashiram Indore, 76, built a pyre and jumped into it on Friday following the poor soya bean yield from his one-acre farm at Manarkhed in Akola. Indore was despondent as just a quintal and a half of soya bean could be harvested this year. The Javadekar family of Javda in Buldhana is facing the grimmest winter after their only son, Shivshankar, 24, hanged himself on Saturday evening as he could not repay the Rs. 60,000 loan his family took after their two-acre farm faced consecutive years of drought. Family members said Shivshankar was aspiring to pursue higher education. Another farmer too committed suicide in the district. A farmer from the northern state of Rajasthan committed suicide during a rally organized by the Aam Aadmi Party (AAP - anti-corruption party) in New Delhi on Wednesday (Indian Express, Economic Times). The farmer used a towel to hang himself off a tree, and also left a note stating that his crops had been destroyed by the weather. New Delhi Chief Minister and AAP leader Arvind Kejriwal was present at the rally to protest the land acquisition bill introduced by the Prime Minister Narendra Modi government. Opposition parties have united to oppose the land acquisition bill, stating that the bill will force farmers and the poor to lose their lands. In 2014, the government used an executive order to amend the land acquisition bill and facilitate the buying of land for industrial projects. Indian Home Minister Rajnath Singh ordered a probe into the suicide and expressed his grief over the suicide. He acknowledged that the number of farmer suicides had gone up by about 9 percent in each of the previous two years, both of which were marred by drought. The crime bureau found that 58 percent of the 12,602 farmer suicides in 2015 were driven by bankruptcy, indebtedness and other farming-related issues. Most of the victims were marginal cultivators or small farm holders with less than 5 acres of land. "Suicides occur due to extreme economic despair," said M.S. Swaminathan, a geneticist whose work on high-yield rice and wheat crops helped drive India's Green Revolution in the 1960s. His research in the late 1980s found that a 1.8 degree Fahrenheit temperature rise reduced a crop's duration by about one week, causing losses in the overall weight of harvest. His foundation works to find farming solutions not only to rising heat, but also to drought or salinity from coastal sea rise. Given these growing risks, he said, government policy has a large role to play. "Suitable crop insurance and a prompt compensation of losses due to climate-related factors will help to avoid a sense of hopelessness that leads to suicide," Swaminathan said.